The Chainsmokers perform on the Rocky stage during the Budweiser Made In America festival on the Ben Franklin Parkway in Phila., Pa. on September 3, 2017. After several days of controversy, Mayor Kenney will meet Monday with an executive of the rapper Jay-Z's entertainment company in an effort to strike an agreement on where the Made in America Festival should be held next year, sources said Friday. The Kenney administration has been taking increasing heat since the announcement Tuesday that this would be the last year the event would be held on the Benjamin Franklin Parkway. Jay-Z denounced the decision and said that neither he nor other executives at Roc Nation — which since 2012 has managed the festival along with concert promoter Live Nation — had been notified of the change. According to two sources familiar with the discussions, Kenney will meet with Roc Nation chief operating officer Desiree Perez and Philadelphia 76ers co-owner Michael Rubin. The meeting could include other participants, but their names had not been confirmed Friday, one source said. Rubin is a close friend of the Philly rapper Meek Mill, one of the headliners for this year's festival on Sept. 1 and 2. Following the news that Philadelphia had brought on a feud with Jay-Z and Made in America officials over the eviction, at least one city offered itself as an alternate location. The Associated Press reported that Milwaukee officials sent a letter Thursday to Roc Nation inviting Jay-Z to bring his festival to their city. >> READ MORE: Tell us: Where should Made in America go? The letter said that Milwaukee is known as a city of festivals because it hosts dozens of events annually, including Summerfest. But city spokeswoman Deana Gamble said local officials don't want the festival to go elsewhere. "As we've said before, we are committed to continuing our partnership with Made in America. We want the festival to remain in Philadelphia," she said. At a news conference Wednesday, Kenney said that he loves Jay-Z and the event, but that holding it on the Parkway had caused problems. "We had some operational difficulties on the Parkway because of how long it takes to kind of set up and take down," he said. Earlier this year, the city initiated a study on large events at the Parkway. Neighbors have often complained about such events. But when the news about the administration's wanting to move the festival elsewhere was broken in a BillyPenn news article, it caught many by surprise. In a commentary published in the Inquirer and Daily News and on Philly.com, Jay-Z said that Kenney had shown "zero appreciation" for the event. The rapper said it generated a $102.8 million economic impact for the city. 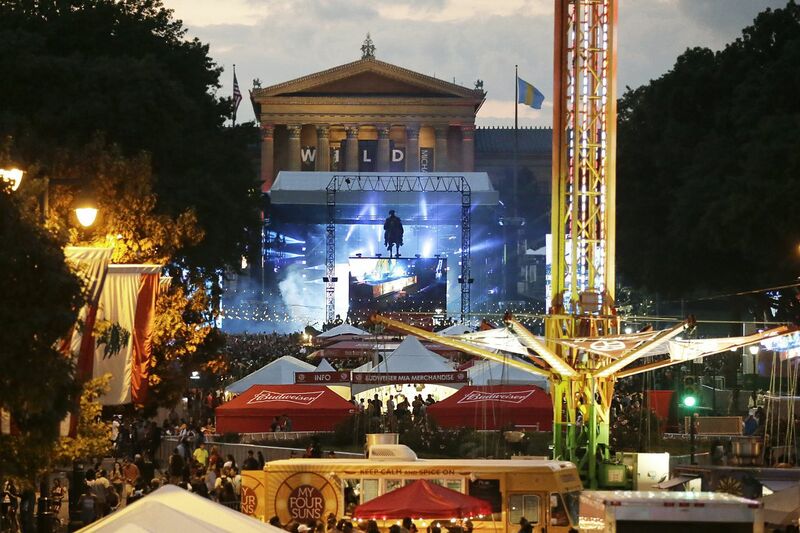 Made in America is held on Labor Day weekend on the Parkway, a venue that includes museums, monuments, and the famed Rocky steps at the Philadelphia Museum of Art. Since its inception, the festival has brought in some of the biggest names in music, including Beyoncé, Coldplay, Kanye West, and Jay-Z himself. >> READ MORE: What does eviction of Jay-Z's Made in America mean for the Parkway? Perez suggested earlier this week that if the city insisted that the festival move, it might not stay in Philadelphia. "The Parkway is very important to Jay," she said, "so I'm not sure that not having the Parkway will work." At Wednesday's news conference, Kenney left open the possibility that Made in America could stay on the Parkway. "We don't know yet," he responded when asked if there was a chance it could remain. "We're talking to the right people."